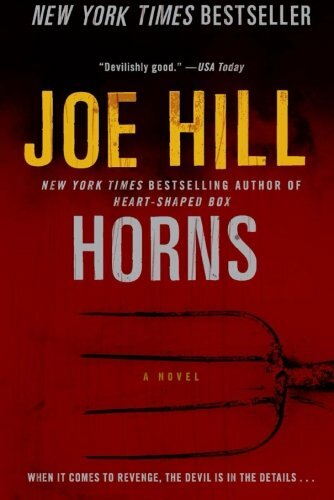 Joe Hill’s Horns is an assured second novel from a well credentialed, award-winning, author. Hill’s 20th Century Ghosts, an anthology of short stories, won several awards including the Bram Stoker Award, the British Fantasy Award, and the International Horror Guild award. His first novel, Heart-Shaped Box, won the Bram Stoker Award and the International Thriller Writers Inc Award for Best First Novel. He has also been a recipient of the Ray Bradbury fellowship. Hill lives in lives in Bangor, Maine, and has three children. Horns tells the story of Ignatius Perrish who, nearly a year after the savage and unexplained death of his girlfriend, Merrin, wakes to find horns growing from his temples. Ig initially believes the horns to be no more than an illusion brought on by stress and grief. However, as time goes on he finds that they are all too real, and with them come abilities that prove to be both an aid and a burden. What follows is a gripping and well-paced exposition of a young man suffering the tortures of loss and betrayal. Ig has come from a life of privilege. A well-regarded musician father and an elder brother on the up-and-up in Hollywood ensure that he is well known. He has grown up in a large, well-appointed, house in the better section of the town of Gideon. All his life he has strived to be good and to do well. He is active in his church and has done well at school. All this counts for nothing though when Merrin, his girlfriend since they were young teenagers, is brutally raped and murdered and the blame falls on Ig. Despite there being no evidence he is still the prime suspect, and everyone in town firmly believes that he is the culprit. Found guilty in the court of public opinion, even Ignatius is not completely sure that he is not to blame. Horns is a well crafted tale of pain and redemption, a sort of Pilgrim’s Progress, in which the protagonist finds his way past the obstacles put in front of him, to a place of peace and acceptance. Hill cleverly inverts the way we perceive certain characters and deftly challenges preconceived ideas of right and wrong, good and evil. While we become aware of who did what to whom quite early in the novel, Hill is able to maintain our interest by regularly changing our focus and by encouraging us to empathize with the central characters. In his villain, Hill has truly created a monster. Yet this is a monster that reflects our very modern tastes. He does not look like a monster, in fact the very opposite, and this is one of the central themes of the work: looks can be deceiving. Over the course of the novel the villain develops beautifully to become the epitome of the modern fiend. He calls to mind the serial killer, the trusted employee, son, or brother who is just not quite right. In this post 9/11 world Hill’s villain illustrates the concept that we never know who the baddies really are until they are found to have done bad things. Hill’s language is very accessible and his narrative is littered with contemporary references. Horns is not a difficult read, and the reader will feel right at home in his fictional world. In fact it is precisely this familiarity and verisimilitude that ultimately give the novel its dramatic impact. By making sure that the reader is comfortable and identifies with his characters, Hill is able to garner greater emotion as the action unfolds. In his hero Hill cleverly investigates what it means to be a man in a difficult situation. He invests Ig with all of the worries and self-doubts that we all carry with us and yet pushes him to make extraordinary choices in demanding circumstances. While appearing to be simple and straight forward, perhaps even pulp fiction, this is an assured work of a mature writer. Joe hill looks past the surface into the dark heart of us all. He challenges our notions of humanity and evil and leaves us questioning ourselves, our societal norms, and our religious views. Horns is a well wrought tale with intellectual merit. Not only are we entertained, we are challenged to think as well.